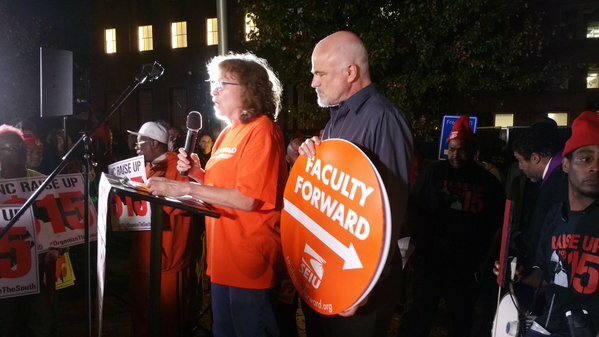 Nearly 54,000 faculty and graduate student workers on 60 campuses have joined the Faculty Forward movement and formed unions. We have won increased compensation, job stability, benefits, professional development opportunities and respect on the job. We’re also working to support debt-free college for students and to pass legislation that ensures part-time faculty makes wages on par with their full-time counterparts. You can see the impact of our movement in greater detail here. Unionized contingent faculty often have a higher rate of pay, regular salary increases and pay protections on work done outside of the classroom. Across the country, median pay per course was 25 percent higher for part-time faculty that had union representation. Unionized contingent faculty have an increased level of job security, better benefits and more than 70 percent of SEIU faculty contracts have established professional development funds. SEIU contingent faculty members often have an expanded and more transparent evaluations process, a clear voice in their working conditions and rights to intellectual property. Are you interested in uniting with your colleagues and forming a union? Here’s how you can get started. Find out more. Read our FAQ. Connect with your coworkers and sign up members.